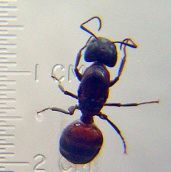 GigaDB Dataset - DOI 10.5524/100018 - Genome data from the Florida carpenter ant (Camponotus floridanus). Here we present the sequenced genome of the Florida carpenter ant (Camponotus floridanus), a species with an organized caste society. As an eusocial species, its genome offers interesting insights into aging, epigenetics and animal behavior. The Illumina Genome Analyzer platform was used to sequence a genomic library of the Florida carpenter ant, obtaining more than 100-fold coverage. The draft genomic assembly reached a scaffold N50 size of ~600 Kb and covers more than 90% of the approximately 240 Mb genome.